May 17, 2012 Thursday, 6 p.m.
Potluck at 6 (optional), movie at 7, discussion with permaculture instructors follows. Saturday, March 10, 2012, 1 p.m. - 3 p.m.
Helena Norberg-Hodge is a winner of the Alternative Nobel Prize and a pioneer of the worldwide localization movement. Her talk is titled "The Economics of Happiness- shifting from global to local." She argues that today's global economic system is fundamentally unstable and incapable of meeting the needs of people and the planet. Her presentation will highlight the inspiring psychological, social, and ecological benefits of economic localization, and steps at the community, national, and international levels that can bring us there. Read more in the poster PDF. Saturday, February 25, 2012, 9:00 a.m. - 2 p.m.
Kaka'ako Waterfront Parks, Cooke Street, makai of Ala Moana Blvd. 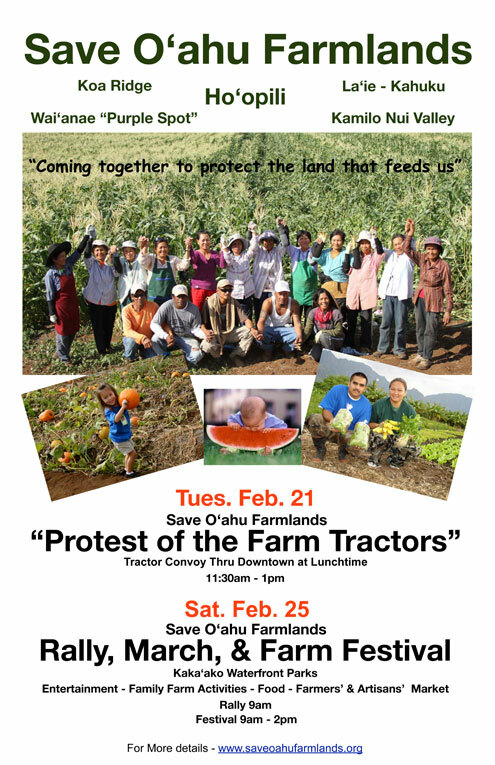 Save O`ahu Farmlands "Protest of the Farm Tractors"
Tuesday, February 21, 11:30 a.m. - 1:00 p.m. Within ninety days, the Land Use Commission will decide on the possible urbanization for both the Ho’opili and Koa Ridge development projects. The highest producing farmlands in the state hang in the balance. Saturday, February 18, 2012 | 8:30 a.m. - 1 or 2 p.m.
$10 at the door ($5 for HPU students). 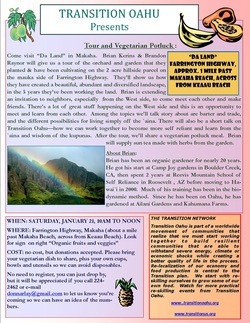 A portion goes to Transition Oahu. Presented in partnership with Don Brown and Monday Movie Cafe. Tuesday, January 17, 2012 | 1 p.m.
Save Oahu Farmlands Alliance, supported by Transition Oahu, seeks to save over 1500 acres of the best remaining farmland on Oahu from being paved over by D.R. 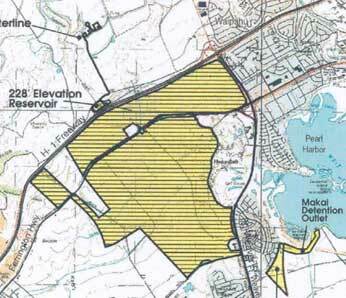 Horton for a subdivision of close to 12,000 homes called Ho'opili. We regard this as a threat to the food security of present and future generations on Oahu, and is short-sighted, profit-oriented planning at its worst. The Land Use Commission hearings continue on the morning of January 19, and are open to the public, but public testimony is deferred until 2:00 p.m.
Additional information can be found at SaveOahuFarmlands.org or by email to Kioni Dudley, drkionidudley@hawaii.rr.com. Come visit “Da Land” in Makaha. 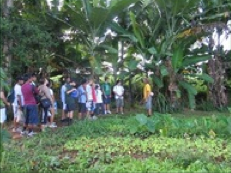 Brian Kerins & Brandon Raynor will give us a tour of the orchard and garden that they planted & have been cultivating on the 2 acre hillside parcel on the mauka side of Farrington Highway. They’ll show us how they have created a beautiful, abundant and diversified landscape, in the 5 years they’ve been working the land. Brian is extending an invitation to neighbors, especially from the West side, to come meet each other and make friends. There’s a lot of great stuff happening on the West side and this is an opportunity to meet and learn from each other. Among the topics we’ll talk story about are barter and trade, and the different possibilities for living simply off the `aina. There will also be a short talk on Transition Oahu—how we can work together to become more self reliant and learn from the `aina and wisdom of the kupunas. After the tour, we’ll share a vegetarian potluck meal. Brian will supply sun tea made with herbs from the garden. Brian has been an organic gardener for nearly 20 years. He got his start at Camp Joy gardens in Boulder Creek, CA, then spent 2 years at Reevis Mountain School of Self Reliance in Roosevelt , AZ before moving to Hawai`i in 2000. Much of his training has been in the biodynamic method. Since he has been on Oahu, he has gardened at Ailani Gardens and Kahumana Farms.